Ocheeva is an Argonian assassin and the head of the Dark Brotherhood Sanctuary in Cheydinhal. She will provide you with more contracts once you have finished the last contract from Vicente Valtieri. Her twin brother, Teinaava, is also a member of the guild. She wakes up at 8am every day and heads to the Sanctuary's Training room, where she will spend a brief moment of silence for one hour sitting in one of the pews in the room, before starting to practice her sneak attacks during the next seven hours. Once she has finished training, she will return to her private quarters to have her only meal of the day until 7pm, at which time she will relax in her quarters while reading a copy of the book The Lusty Argonian Maid for five hours. After she has finished reading she will decide to stroll around the Sanctuary for a few hours, until she goes to bed at 4am. Her equipment consists of the typical Dark Brotherhood's shrouded armor. She is also armed with an unenchanted leveled dagger, and also carries her copy of The Lusty Argonian Maid along with Telaendril's note, the key to unlock the abandoned house, and a leveled amount of gold. Ocheeva possesses an ability which gives her resist magic and normal weapons 20%. She is the first person you meet once you have been granted access to the Sanctuary, and welcomes you with open arms: "Greetings, brother/sister! Greetings! I am Ocheeva, mistress of this Sanctuary. Lucien has told me all about you. I welcome you to the Dark Brotherhood! You stand now in our Sanctuary. May it serve as your new home, a place of comfort and security whenever the need arises. When you're ready for work, go and speak with Vicente Valtieri. He handles all assignments for new family members. But before you go, please accept this gift from your new family. A unique set of armor, lighter than normal leather and black as the Void. Now, I've kept you long enough. Vicente is waiting. You'll find him in his quarters. Go now, my child, and may Sithis go with you." When she is asked about the mysterious Lucien Lachance, she will tell you about her role in the Sanctuary:"Lucien isn't here very often. His duties with the Black Hand keep him very busy, so he trusts me to keep the Sanctuary in order.". She is also aware about the recent events in the guild, as she will tell you if you ask her about rumors:"I...I've heard some talk. This past year, some family members have been found...murdered! Could there be an assassin among assassins?" If you talk to her again before accepting your first contract, she will say" "Greetings once more. I know you must be eager to get to work. I think you'll find the task Vicente has available to be quite intriguing." And after accepting, she will say, "I see you've accepted the contract from Vicente. Very good. With every life you take, Sithis grows stronger, and the Brotherhood flourishes. After first talking with her, Ocheeva's dialogue will vary depending on her disposition towards you. If you approach her with a disposition above 70, she will say, "I am honored by your presence. How can Ocheeva be of assistance?" If between 30 and 70, she will ask, "You are finding your contracts agreeable, I hope?" If below 30 however, she will insult you: "I do not know what Lucien sees in you, but this Sanctuary is cursed by your presence." Her farewell dialogue follows the same pattern. If she likes you, she'll say, "Go now, dear family member, and may the Night Mother wrap you in her cold, loving embrace." If her opinion is neutral, she'll say, "May the Night Mother guide you." If she hates you, though, she'll annoyingly say, "Sometimes I think Lachance will let anyone into this Sanctuary..." Her greeting dialogue, however, assuming you don't have a quest with her, is the same regardless of disposition: "Greetings, Brother/Sister. I do hope you are well." As the leader of the Sanctuary, Ocheeva is quite knowledgable about it: "Ours is not the only Dark Brotherhood Sanctuary. There are others, hidden throughout Cyrodiil, each one overseen by a Speaker of the Black Hand." She will also tell you about Sithis: "Those fools in the Church and their so-called "Nine Divines." There is no divinity beyond the eternal and terrible rule of our Dread Father, Sithis." and the Night Mother: "To employ the services of the Dark Brotherhood, one must perform a ritual to the Night Mother. Only then will she heed their prayers for murder. It is an ancient rite, this Black Sacrament. All across the Empire, every day, people beseech the Night Mother to take the lives of others. After a person performs the ritual, they are contacted by a Speaker. Gold is exchanged, and the details worked out. So it has always been." After you have spoken with her twin brother, she will give you some background info about how they joined the Dark Brotherhood if you select the topic of Shadowscale:"I see you have been speaking with Teinaava. What he says is true. All our lives we have lived together in the shadows. We are egg mates. Twins. We were taken at birth, and given to the Dark Brotherhood. We returned to Black Marsh as Shadowscales, trained in the arts of stealth and murder. Together we served our nation as spies and assassins, as all Shadowscales do. When we came of age we joined the family as one. And here we are." "I killed a pirate once. Of course the ship was out to sea at the time. Somewhere between Vvardenfell and Solstheim. Now those were the days." "I serve Lucien Lachance and the Dark Brotherhood, and will guide you as directed. But you will get no additional help from me." "If things go badly, forgo the plan and simply kill the mark in any way you can. You'll lose the bonus, but at least the contract will be fulfilled." "For the love of Sithis, you have to kill a feeble old man. Is that too much for you to handle?" "No Dark Brother or Sister has successfully infiltrated the Imperial Prison in over three hundred years. This will be a true test of your abilities." "I was hoping Vicente would give you this contract. When you are captured and killed, the assignment will go to someone more competent." "I have given you little more than a name. I can only pray that you'll wander the Imperial City aimlessly for days, and then eventually die of hunger." "It's uncertain exactly what illness Roderick has contracted. But don't worry, it's probably not contagious. He he he he he." "Actually, I gave you this contract in the hope that whatever Roderick has is contagious, and you'll die a slow, lingering death in a matter of days." "Each guest, at some point in the past, wronged their mysterious host. Now he's hired us to exact his revenge." "I take much joy in giving you this contract. With so many targets come so many opportunities to fail. The chance of you surviving is slim at best." "Adamus Phillida will find no rest in retirement. No, his soul will endure a kind of eternal suffering known only to those who have angered Sithis." "It's not my place to question the wisdom of Lucien Lachance or the Black Hand, but trusting you with the Rose of Sithis? It is... folly." 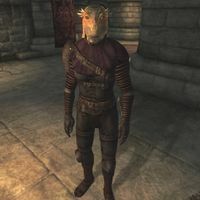 Also, if you accepted to help her brother to eliminate a renegade Shadowscale, she will tell you why Scar-Tail deserves to die a painful death:"Scar-Tail is a traitor to Argonia, and a blight upon Tamriel! Kill him, as my brother requests, and we will be forever in your debt." And once you have given her the news of your deeds, she will happily thank you for your help:"Scar-Tail now lies with the worms of Bogwater, thanks to you. I am forever indebted to you, Brother/Sister." Once you have completed your contract for The Assassinated Man quest, she will become your current contract giver, as Vicente Valtieri explains to you:"Well now, you are an ambitious one, aren't you? I'm afraid I have no more contracts for you. Our time working together has come to an end. Instead, you must report to Ocheeva, here in the Sanctuary. She will be providing all your contracts." As you would expect, she is anxiously waiting for your arrival, as she will express when you speak to her for your next job:"Ah, greetings, I have been waiting for you. As Vicente surely told you, your time working with him has come to an end. From now on, you will receive all assignments directly from me. In fact, your next contract is available now." "In the Imperial City there lives a High Elf who must be removed from existence. Finding this person may prove... challenging." If you decline the contract, she will patiently tell you, "As you wish. Don't worry, the contract will be available whenever you're ready." Once you accept the contract, she will fill you in with the details of the target:"I knew you wouldn't be able to resist. Your target is a High Elf named Faelian. He lives somewhere in the Imperial City, and fancies long walks. Unfortunately, that's all we know. We don't know which district he calls home, which establishments he frequents, or anything about his schedule. This contract will require a bit of detective work. I suggest you to speak to your fellow Brothers and Sisters and see if they can offer any advice. Ah yes, there is one more thing. The Imperial City is also home to an Imperial Legion captain named Adamus Phillida. Do you know who that is?" "Phillida has dedicated his life to eradicating the Dark Brotherhood, and he becomes rather irate when our duties take us to the Imperial City." "Quite. Then you know he has dedicated his life to eradicating the Dark Brotherhood, and doesn't appreciate when we operate within the Imperial City." "Heed my words. Phillida has dedicated his life to eradicating the Dark Brotherhood. He will not tolerate our operations within the Imperial City." She will then continue with: "When that happens, he tends to make our lives uncomfortable. Let's not give the good captain any reason to go poking around in our affairs, hmm? If possible, do away with Faelian someplace out of the way. Definitely indoors, with no other people around. A secure location, with no witnesses. This will make it look like a simple murder. Phillida will be none the wiser, and you'll receive a nice bonus. Now go, and may Sithis go with you." If you talk to Ocheeva before Faelian is killed, she will urge you on: "While Faelian walks the streets of the Imperial City, the Night Mother weeps in her restlessness. Kill this High Elf, and all will be well." If you return to her after having failed to kill Faelian in the manner specified she will say:"Yes, Faelian has been killed, but you did not exercise discretion. How many witnesses were there? We may never know. But you can be sure Adamus Phillida will suspect the Dark Brotherhood was involved, and will launch an investigation. I had hoped to avoid such an... irritation. Here is your reward, but the bonus is forfeit. Do try to be more careful next time, hmm?" However, if you succeeded in killing the target carefully, she will congratulate you:"The High Elf Faelian now swims in the maelstrom of darkness at the feet of our Dread Father, Sithis. And, there were no witnesses to your handiwork. Because of the discretion you exercised, Captain Phillida will not suspect the Dark Brotherhood was involved, and will not meddle in our affairs. Here is your reward and bonus. Both have been well earned. Go now and rest, and may the Night Mother guard your dreams." "Far to the west there lives a fierce warlord and his company of loyal mercenaries. Your target is the warlord. Do you accept this contract?" If you turn down the contract, she will tell you,"Very well. Return to me when you are ready, and the contract is yours." Once you have accepted the assignment, she will explain to you the details of the deed:"Excellent. Now listen closely. Nestled in the mountains to the west lies Fort Sutch. It is the home of the warlord Roderick and his mercenaries. Roderick has recently taken ill. He now lies in eternal slumber, kept alive only by the daily administration of a powerful medicine. You must infiltrate Fort Sutch, find Roderick's medicine, and replace it with a poisoned bottle I will provide. But you must remain undetected! Whomever arranged this contract wants it to look like Roderick died from his illness, so discretion is essential. Attack no one! Be seen by no one! If you are detected, the poisoning will fail, and Roderick must be killed in some other manner. That will, of course, forfeit your bonus." If you talk to her before the contract is completed, she will remind you, "Roderick may lie near death, but dead he is not. Until his soul has passed, our client -- and Sithis -- will not be satisfied." If you failed the contract, she will be disappointed and tell you:"Roderick is dead, and Sithis is appeased. Unfortunately, the same is not true of the client who arranged this contract. You were to avoid detection and kill Roderick by means of poison, yet you failed to follow these parameters. Here is your reward, minus any bonus. It would seem you and Gogron share a similar... style. Now go, and do be more careful in the future." However if you were successful, she will say instead:"Ah, so you infiltrated Fort Sutch, remained undetected, and replaced the medicine with the poison I provided. You are truly a master of shadow! It pleases me greatly to offer you this reward, and a well-earned bonus. Go now. Rest. I'll have another contract ready whenever you are." "Do you like parties? Because you've been invited to one. Of course you'll be killing all the other guests. Are you ready to attend"
If you turn down the contract, she will say, "All right. But don't take too long. The other guests are already assembled, and they're waiting on you." Once you agree to the assignment, she will tell you the details:"Splendid. You need to go to the city of Skingrad, to the large house known as Summitmist Manor. There you will meet up with five very unlucky guests. In order to receive your bonus, you must kill each guest secretly, one by one. If anyone sees you commiting [sic] murder, the bonus is forfeit. The guests believe there is a chest of gold hidden in the house, and have agreed to be locked inside until one of them finds it. In fact, the guests believe the key to the manor is inside the chest, and only by satisfying their greed will they be allowed to leave. Poor fools. There is, of course, no chest of gold. The guests will find no key. After you arrive, the doors will be locked behind you, as everyone expects. When all the guests lie dead, you will be free to leave. Now go, see the doorman at Summitmist Manor. He will explain the rest. Have fun." If you talk to her again before the contract is finished, she will say, "The other guests are waiting for you at Summitmist Manor. I suggest you get going." If you were detected while fulfilling the contract, Ocheeva will reprimand you by saying:"You managed to kill the five house guests, yes. But your inability to remain undetected will cost you. I must admit, I'm disappointed. This was an important contract, and you stumbled through it like a drunk. Leave me now, and think upon your failure." However, if you instead bring good news of your deeds she will say:"Well done! Not only did you kill the five guests, you acted as an agent of terror and grief. You have earned your reward and bonus, Assassin. I lay upon you now the Night Mother's Blessing. May she walk with you always, and guide your hand as you act in accordance with the Five Tenets." "Do you recall the name Adamus Phillida? The Imperial Legion pest? It's time he joined Sithis in the Void. Think you're up to the task?" If you turn down the contract, she'll be very disappointed: "Do you realize what you're saying? Do you fully understand the honor you are rejecting? For your own sake, return to me when you're ready." Once you have accepted this very important contract, Ocheeva will explain the situation further: "Adamus Phillida has spent his entire career investigating the Dark Brotherhood, interrupting our contracts, killing our family members! We tried to eliminate Phillida, of course, but failed on three separate occasions. He's a powerful man, and was surrounded by powerful associates. Now the Legion's pig years of service have come to an end. He has retired. Phillida must not be allowed such a victory! His destiny is... darker. Phillida now resides in Leyawiin, in the City Watch barracks, an honored guest of the soldiers there. He is, in fact, more vulnerable than ever." "The Black Hand has sanctioned the Rose of Sithis. It is a magic arrow specifically enchanted to kill its target. In this case, Phillida. " "Ha ha ha ha ha! Yes! Yes! The Black Hand has sanctioned the Rose of Sithis. It is an enchanted arrow that will kill Phillida... instantly!" "Listen well, my child! The Black Hand has sanctioned the Rose of Sithis. It is an enchanted arrow that will kill Phillida... instantly!" She will then continue with: "As long as the arrow hits Phillida, he will die. But it cannot pierce armor! Shoot while Phillida is armored, and the Rose will be wasted. Travel to Leyawiin. Track Phillida. Learn his schedule. Observe when he removes that blasted Legion armor! And then, let fly the Rose of Sithis! Kill Phillida in any way, Rose or not, and the contract is complete. But to receive a bonus, you must go beyond murder. You must send a message! Once Phillida is dead, take the very finger from his corpse, the one that bears an Imperial Legion signet ring! Deposit this finger in the desk of Phillida's successor, in his office in the Prison Barracks, in the Imperial City! Do this, and the bonus is yours." If you talk to her again before Phillida is killed, she will urge you, "Adamus Phillida has been a thorn in the Dark Brotherhood's side for far too long. Kill the pig, so Sithis can enslave his soul for all eternity!" When you return to her, she will express her joy by saying:"Adamus Phillida is dead! I could feel my heart swell with the Night Mother's love the moment that Imperial pig issued his last breath!" However, she will either conclude by saying:"Sadly, you chose not to leave Phillida's severed finger as a warning to his successor. Your laziness has cost you your bonus, I'm afraid. Now go. Get some rest. I'll have another contract ready for you shortly." if you didn't complete the contract accordingly, or :"You also managed to leave Phillida's severed finger as a warning to his successor. Well done! Your bonus, 500 additional gold coins, is well-earned! Go now. Get some rest. Sithis knows you've earned it. When you're ready for another contract, you need only ask." if you fulfilled the contract with the necessary parameters. Despite what she says, Ocheeva will no longer give you any more contracts. She will however give you one more task from the Black Hand: "Ah, Assassin, I must speak with you. It is quite urgent. A sealed letter just arrived from a Dark Brotherhood courier. I recognize this type of parcel. It contains sealed orders. It's addressed to you... from Lucien Lachance. You must open these sealed orders immediately and follow their instructions to the letter. It would seem the Black Hand itself has a task for you." If you talk to her before reading the letter, she will urge you, "Assassin! Why are you still here? Have you not opened your sealed orders? Go now! The Black Hand obviously has need of your abilities!" After receiving the task from Lachance, she will be pleased: "You've seen Lucien Lachance, then? Good, good. I know whatever task he has for you will be carried out with skill and discretion." She will also insist that you complete the contract, unaware that she is one of the targets: "Lucien Lachance's word is law. Whatever contract he has given you must be carried out, without question." Esta página foi modificada pela última vez à(s) 05h52min de 26 de janeiro de 2016.